GOODYEAR, Ariz. (AP) Presumably, they will all be ready to pitch the first week of the season. Right now, Cleveland's loaded starting rotation is in limbo. With the March 28 opener at Minnesota drawing near, manager Terry Francona has yet to say who he will start against the Twins or how he will configure his starters in the early stages of the season. Potential trades involving two-time Cy Young winner Corey Kluber and All-Star Trevor Bauer never materialized this winter, leaving the lndians with an arsenal of right-handers, including Carlos Carrasco, Mike Clevinger and Shane Bieber. The strength of the rotation is one reason the Indians are predicted to win the AL Central for the fourth consecutive year. Francona and pitching coach Carl Willis are evaluating how to seize momentum in April by lining up the pitchers in the most efficient early season order. One factor is recognizing that only Bauer will have pitched enough in spring training to build up the arm strength to go longer. "We want to keep Trevor in between Carrasco and Kluber, the reason being, for early in the season, Trevor is the one guy situated to probably go deeper in the games," Francona said of Bauer, who went 12-6 with a 2.21 ERA in 28 starts last season. "Staffs are never quite stretched out when the season starts, so Trevor is the one guy (stretched out). So, we want to keep him in between, so we don't tax our bullpen." Bauer, a proponent of frequent throwing, along with long toss and weighted ball use, has started three Cactus League games, completing 11 innings, including extensive experimentation on his new changeup. Bieber, in his first major league camp, has made two starts, for five innings. Clevinger pitched for the first time on Wednesday and Carrasco and Kluber will make their Cactus League debuts on Sunday and Monday. "We have it lined up where Kluber could go Game 1 or later if need be," Francona said. "We've kind of lined it up where we can do some things. At some point, you kind of have to make a decision, but Carl's done a good job. Like we have one game where Kluber's pitching and Clev's (Clevinger) coming in after him. Then, we'll separate them after that. 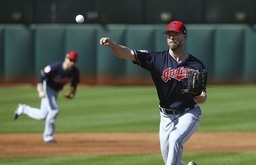 Clev needs to repeat his three innings, and so he'll do it coming in after Kluber." If Kluber rested five days between Cactus League starts, he would start again on March 17 and March 23. Then, on four days' rest, his fourth consecutive opening day assignment is conceivable. The prestige of starting on opening day is another factor. Francona was asked if the feelings of a player should be a factor. "We try to take into consideration what's best for our team," he said. "We try to instill in our guys team-first attitudes, also recognizing that there are some things (that matter). Yeah, we get it. We've talked to Kluber about it. I think he'd like to be ready for that opening day. And if he is, for all he's done, he's very worthy of pitching on opening day." In the next breath, Francona noted that Bauer and Carrasco are worthy of getting the ball on opening day, too. "We're pretty fortunate in that we got pitchers - that if something happened - we could throw any of them out there and we feel like we got a good chance to win," he said. Catcher Kevin Plawecki, who was acquired in a trade with the Mets on Jan. 6, spent the past four seasons working with exceptional starters Jacob deGrom and Noah Syndergaard. He knows the Indians have something unusual. "The guys here are all special," he said. "One through five, you are going to have a guy who has a chance to win every night." The quintet is at different stages of their careers. Bieber, 23, is at the beginning. The former University of California-Santa Barbara standout rose from Double A to win 11 games and post a 4.55 ERA in 2018. Carrasco, who will turn 33 on March 21, recorded more than 215 strikeouts in three of the past four seasons. Clevinger, 28, combined with Kluber, 32, to become the fourth duo in Indians history to pitch at least 200 innings and exceed 200 strikeouts. Bauer, 28, pitched so deeply into games in 2018 that he logged 175.1 innings, one fewer than in 2017 despite missing six weeks recovering from a stress fracture in his fibula, incurred by a line drive on Aug. 12. "Trevor Bauer had a year that was like a kind of a coming out (party)," Francona said. "And I actually think he's going to get better with the development of his changeup." NOTES: Jake Bauers, who has shown versatility as a first baseman and an outfielder, said he played shortstop in Little League, even though he's left-handed. He also caught and pitched. ... OF Greg Allen, contending for playing time among several outfielders, made an impressive catch Friday night, slamming against the center-field wall. Allen is hitting well, too, batting .421 (8-for-19).